At the end of September I took the shortest but sweetest road trip through the Canadian Rockies along the Icefields Parkway. I’m not really one for driving much but this road has easily made its way to the top of my ‘Favourite Roads to Drive’ list. The route is surrounded by soaring snowy peaks, terrific glaciers and brilliant blue lakes – what more could you ask for from a Canadian road trip? All of this amazing scenery was enhanced by the colourful, autumn leaves getting ready to fall. My friend Jess and I started roughly planning our road trip back in July but until September it felt more like a daydream than a reality. We hired a rental car and set off after work late on Sunday night with the plan of driving to Kamloops (four hours east of Whistler). We only had the first night’s accommodation booked and packed sleeping bags and blankets with the intention of sleeping in the car at least one night to keep spending down. Driving my first automatic was great. We were given a Ford Escape as a free upgrade which meant we would have more than enough space for sleeping and the heated seats were a dream. Our first stop as we drove through the canyon was Medicine Lake. Even with the dark clouds looming overhead, it was still a spectacular sight. It was extremely shallow with parts of the riverbed poking through creating a strange, marbled grey-blue colouring. On one side of the lake huge grey stone slabs burst out of the ground; on the other, a sad troop of dead trees stood burnt and bare from a past forest fire. This immense view was an unexpected highlight of the trip for me and is often over looked in favour of it’s sister Maligne Lake. While Maligne Lake is beautiful, it wasn’t the best weather or time of day to view it in all its glory. The distance snow-capped Rockies at the far side of the lake draw your eye immediately. The shimmering, dark water is enchanting and on a good day you sit for pondering life for hours. By this point in the day, we sadly realised we wouldn’t have time to visit the popular Miette Hot Springs so drove back to town for warm supper before looking for a place to park and sleep for the night. Opting to reduce the hours of driving the next day, we parked by the trailhead of Wilcox Park and settled down for our first night in the car. We awoke to frozen condensation on the inside of the car windows. Despite all my preparations, I spent most of the night shivering in my sleeping bag, trying to keep my nose from falling off my face from lack of blood. At 7am the sun was still hiding behind the mountains so we went back to sleep for another hour. By 8am we were greeted by a cold, cloudless, blue sky and decided to get going while the weather was on our side. Parking next the trailhead had turned out to be a great plan as the parking spaces were quickly starting to fill. I had researched hikes that take you to a viewpoint for the Athabasca Glacier, a free way to see it and hopefully a less crowded option. The Wilcox Pass seemed to be the best choice (I got my information from 10hikes.com). It’s a scenic route taking you up through an bank of trees opposite the glacier and then up a ridge to the pass. There was a lot more snow than we had expected but it was still passable in good hiking boots. Starting early also meant we had the 360° views almost entirely to ourselves and the snowy pillows and clouds which had formed during the morning seemed to go on forever. Getting back to the car around midday, we had our packed lunches and headed off down the Icefields Parkway to Peyto Lake. This lake was one of my ‘must-see’ destinations. Having seen all my friends stop off there on longer road trips, I knew from their pictures it would be unmissable. When we pulled into the car park it was bustling; naively I hadn’t realised the lake would be such a tourist hot spot. At the main platform it was awful with people battling to the get the perfect shot of themselves in front of the iconic aqua lake. This is just the kind of situation I hate being in – it feels like such an unnatural way of appreciating nature. Thankfully I had done my research so we detoured to the ‘Upper Viewpoint’ (thanks again 10hikes.com). Here we had a peaceful and uninterrupted view of the awesome lake, mountains with a dusting of snow and endless evergreen forest. It was hard to believe a few hundred metres away crowds were squabbling for space while we had our own private area. It’s the kind of view you dream of seeing and even now it’s hard to believe I was really standing on that rock with the wind whipping around my head. After deciding against another night in the cold car, we drove on the Banff town centre in search of cheap, last minute accommodation. We soon realised this isn’t something Banff offers. After checking a couple of hotels and ringing around the local hostels, the only place we could find that had a half-reasonable price was back the way we had just come, in Lake Louise. So we grabbed a quick bite in the surprisingly commercial town centre (a bit disappointing in my mind – who needs multiple shopping malls in a mountain town?) before heading there to enjoy a well-deserved shower and good sleep in a warm bed. We were raring and ready to go on the final day of our road trip. Being in Lake Louise had its benefits as it was the next stop on our list. We got a good spot at the car park even though we didn’t arrive until after 9:30am. Thankfully the lake itself wasn’t too busy with tourists evenly spread around the bank. There were plenty of spots to pose for photos and even with clouds covering every inch of the sky, the lake still had its characteristic turquoise colouring. 10hikes.com came in handy one more time with its suggestion of the Plain of Six Glaciers hike. This was undoubtedly the pinnacle of the trip for me. I’ve never seen so many snowy glaciers in such a rugged setting, even in Patagonia. I hiked hard and fast up the narrow snow-covered ridge to the furthest point of the trail and quickly put my coat back on for the exhilarating bum-slide adventure on the way down (no one else seemed mad enough to attempt this technique). The wind was wild up there and it was nearly impossible to a good shot to prove you’d made it all the way to the top. Annoyingly the nearby Moraine Lake car park was still full after we had finished visiting Lake Louise so we has to pass on this popular attraction. It will certainly be somewhere to go back for from what I’ve heard and seen online. This meant we had time for one last stop before leaving the Icefields Parkway. We drove to Johnston Canyon and ventured up to the smaller of the two main waterfalls. It was just a short walk from the car park along a narrow, man-made platform system. Thankfully is wasn’t crowded so we didn’t have to overtake too many times. Although it was a short stop-off, it was still an amazing canyon to see and worth a full tour next time around. Before we knew it, we were on our way back to Whistler, which is saying a lot as it was 10 hours of driving. In three days we covered hundreds of miles (I forgot to check for the final count…) and saw some of the world’s most amazing and breathtaking landscapes. As always, more time would have been great, but I see this adventure as more of an introduction to the Canadian Rockies than the final chapter. If you have any questions about the road trip, feel free to drop me a message in the comments below. It’s hard to believe it’s been a year since I left England. It feels like a lot has changed in my life since the 30th of June 2017 when I was loaded up with all my possessions in Heathrow airport waving goodbye my mum and that easy lifestyle. I didn’t know how it would work out and I was especially nervous starting off in Venezuela. But now looking back I wouldn’t change a thing. I’ve learnt a lot in the last 364 days and although from the outside I probably look the same as I did before I left, I feel different on the inside. So, I decided to share 10 lessons I’ve learnt travelling this year, hopefully you can relate to a few if you’ve been on your own journey. 1. Self-belief – travelling independently has taught me to believe in myself, as clichéd as it sounds. I decided where I wanted to go and what I wanted to do and I did it. Even when things looked a bit sticky, like crossing the border into Colombia on foot or getting to the front of a four hour border queue in Ecuador and being told I haven’t got the right passport stamp; I managed to sort myself out. I turned up in Canada without a job or a place to live and I figured it out. Just because others doubt you, doesn’t mean you should doubt yourself too. 2. Language skills are really helpful – this is one of the most practical life lessons. Learning some Spanish along the way was really helpful. I was definitely ignorant thinking I wouldn’t need to speak the local language. To really experience the culture of a nation, you need to communicate in their language. The next time I travel somewhere new, I’ll take a short language course before I set off. 4. My worldly possessions don’t mean as much as I thought they did – I can be a bit of a hoarder at times, especially for mementos like ticket stubs. After having to carry everything I have on my back for four months I’ve realised, do I actually need all this stuff? Especially clothes – I don’t need tonnes of tops, dresses and shorts that I never even wear. I’m much more comfortable wearing leggings and jumpers anyway. 5. Desk jobs are really not for me – I kind of knew this before I set off on my adventures but travelling really confirmed it for me. I can’t just quietly sit at a desk doing the same thing everyday. It doesn’t fit my personality and I’m so glad I learnt this now rather than 10 years down the line when I don’t know why my life feels so unsatisfied. 6. How to spend money more wisely – I still can’t claim to be any kind of budgeting expert. I’ve always spent money as fast as I’ve earned it but travelling definitely taught me (sometimes the hard way) that you can’t afford to do everything you want to do, even if you have the cash now. Travelling for five months without earning a penny means you have to consider what it’s worth spending money on and what you can live without. 7. I’m more outdoorsy than I thought – in the UK I was never interested in hiking or landscapes. My idea of a perfect day at home used to be watching movies and baking. Walking the dog was always a chore I resented and going for a run would be rewards with hours of doing nothing. Now I’m much more excited by outdoor activities and most of goals for the summer are around hiking and camping. My best memories of the last year have all been outdoors, especially teaching kids to ski. 8. Working with kids is great – a perfect segue here. I’m never had a job working with kids before. I’ve volunteered as a sports coach and I’ve done the odd bit of babysitting for family friends but actually being paid to hangout with kids all day and teach them how to do something you love is great. I don’t know if I’d feel the same teaching children in a classroom environment but I’m tempted to try in the future. 9. I have the best family in the world (but I already knew that really) – my family has been there for me the whole way through my travels, even when friends haven’t. My mum especially has been so supportive and helpful, whatever the time difference or situation; my auntie has to be the biggest fan of my blog, commenting on nearly every post, closely followed by my grandmother, and I couldn’t be closer with my cousin. Travelling on your own definitely has highs and lows but with my family behind me I didn’t feel alone. 10. If you want to make a life change, you have to do it for yourself – this last one speaks for itself, really. A lot of people didn’t believe I could or would do all the things I’ve done this year. I wasn’t happy with my life before I left but through the life changes I’ve made I feel now I can determine my own happiness. This is a question I have been asking myself on and off since Whistler mountain closed on the 22nd April 2018. I have always been very clear that the reason I came to Canada and to Whistler is to ski. I chose this resort out of all the other quieter, less expensive resorts in Canada because of its huge terrain. I spent a month or so training to be a ski instructor and an amazing six weeks teaching children how to ski. Now the lifts are closed and the snow is melting, what am I still doing here? I don’t have a profound answer to this question. I’m not sure I even have a real answer. All I know is I don’t seem to be able to leave. All the people I have met here over the winter have been telling me how much I will love summer; how it is so much better than winter, how there is so much more to do. But when you are doing something you love, do you need anything more? Over the last six months, skiing has become a huge part of my life. It has transformed from a hobby to a lifestyle – something I plan my week around. All of my best moments since being here have been on skis, whether it’s passing my instructing qualifications, helping a friend to conquer new heights, teaching my first lesson, winning a race, getting the freshest tracks on the biggest day of the year or starting each Sunday watching the sun rise over the mountains. This mystical place has won my heart and just because it’s closed for the winter doesn’t mean I can turn my back on it. What I didn’t realise when I chose Whistler was that it has such a popular mountain biking scene in the summer. Those who know me well will know I don’t know how to ride a bike. It’s not something I talk about much, mostly because I find it embarrassing. People always follow this discovery with, “do you know how to swim?” as though I’m deficient in all of life’s basic lessons. Maybe this will be the year I learn to ride, if I can afford to buy a bike, but for now this activity is barred to me. There’s lots of other summer activities that are popular with locals here like fishing, camping, frisbee golf (frolf) and swimming in lakes, I just need to find one that works for me. In the last year while I traveled through South America I discovered a passion for hiking that I’d never had in the UK. I’d always thought walking was just a slow way to get to where you wanted to be. Thankfully, there’s a lot of hiking to do in Whistler and British Colombia. While I have to be a lot more careful not to wander into a bear here than I did in Patagonia, there’s still going to be places I can discover on my own. And anyway, if I need to be part of a group to hike, at least it encourages me to be more sociable. So, while I might still be sad that the ski season is over, I’ll try to make the most of the summer in front of me and the beautifully transforming landscape that surrounds me here. It might not be a winter wonderland but it still beats the skyscrapers of London hands down. I am now writing this post nearly a month after concluding my journey in South America. How I have managed to get so far behind is a mixture of being extremely busy and extremely lazy. I apologise to anyone who has been waiting to hear the conclusion of my adventures. Writing this post has been on my mind nearly everyday and perhaps I have been putting it off because I didn’t want to believe that chapter of my story is over. But now that I have been in Canada for nearly a month, I am starting to come to terms with my changing circumstances and lifestyle. While my adventures are not so varied, they are still exciting. I have been very fortunate to have experienced so much in such a short space of time and I’ll look back over this record in the future with happiness and nostalgia. And so, now it is time to conclude the final chapter of my South American backpacking trip with a 10 day highlights of my time in Brazil. I had intended to spend two weeks in Brazil at least, but as is always the way, you never have enough time to do everything. Brazil is a huge country and I knew that there would be no way to get a flavour of the whole place in such a short space of time, so I limited myself to three popular southern highlights: Iguazu Falls, Rio de Janeiro and São Paulo. This spectacular natural beauty really does deserve a post of it’s own. I remember saying before I arrived in Iguazu that I’m sure the falls would be beautiful but I doubted they could compare to the awesomeness of Angel Falls in Venezuela – the first stop on my trip. This proud assertion couldn’t be more mistaken. The falls sit on the border between Argentina and Brazil – luckily I had enough time to see them from both sides. Most travellers only see one side but I’m so glad I got to see both. I couldn’t pick a favourite side though. In Argentina you are above and below the falls, and the main attraction is the platform that comes out onto the top of the Devil’s Throat. From there you can see the huge mass of water come over the top of the falls and crash down into a foamy expanse at the foot of the cliff. This part of the national park is supposed to be the busiest but I think I must have chosen the perfect time to reach the end of the platform because there was plenty of space to enjoy the view. There is an opportunity to take a boat trip into the falls on the Argentinean side but I decided it was too expensive and I had been on a lot of boats recently. The next day I crossed into Brazil, finally leaving Argentina, with some friends I had met in Peru and Bolivia. It wasn’t the smoothest of crossings as the bus driver forgot to stop at border control so we could get passport stamps. Instead, he left us 200 metres into Brazil on the side of the road with our bags. We walked back to the border, got our stamps and waited for the next bus. Luckily we were staying at the same hostel – a very cool Tetris container hostel – so we travelled together the whole way and went to the Brazil side of Iguazu together as well. The Brazil side of the falls is just as spectacular. From there you get a panoramic view of the falls on all sides, ending with a platform that takes you into the middle of the base of the Devil’s Throat and covers you in spray. The weather was perfect on both sides but because of the spray, the Brazil side was covered in rainbows. I haven’t seen such intense rainbows before and they really added to the magic of the scene. We were very glad that we had gone when we did because it rained all the next day. I can’t recommend one side more that the other, they were both amazing and equally priced. You don’t need to book a group tour to see either, the public buses are regular and inexpensive and the beauty of the falls speak for themselves. This was really one of my favourite parts of my whole South American experience. It’s definitely a must-see for any travel enthusiast. From Foz de Iguassu (the closest town to the falls in Brazil) I flew to Rio de Janeiro – pronounced by Brazilians as “Hieo” instead of Rio. Annoyingly for the four days I was there, the weather wasn’t great. It was hot and humid and cloudy. I didn’t get to enjoy the famous crystalline beaches like I’d planned but I did get to know more of the culture than I had expected. I started out with a walking tour, as always, to get my bearings of the city and learn about the history. This was a pretty good walking tour by comparison to some of the others and so I decided to also pay for the food tour the same company offered. It was good value and something I hadn’t done up to this point in the three and a half months I had been travelling. Although I couldn’t name any of the dishes it was delicious food and interesting to see the Caribbean influence. I also tried a lot of coxinha’s while I was in Rio, which are shredded chicken and cream cheese, covered in a dough and then fried. They’re made in the shape of a tear drop but it’s supposed to resemble a chicken thigh, apparently. They are extremely unhealthy, but also extremely delicious. Later I took the cable cart up to the top of Sugarloaf Mountain just in time for the sunset. Unfortunately the clouds got in the way for most of it and I was taken off guard by the strong winds but it was still a beautiful place to see panoramic views of the city. The next day I decided to take an early morning stroll along the famous Copacabana beach, despite the bad weather. I was very nervous of being robbed but I decided to take my phone anyway as I really wanted to take pictures. In the end I had no problems and there were others with their phones. I could almost imagine how busy that beach is in the summer but I don’t think I could have stood the heat anyway. My final highlight of Rio was visiting the huge botanical gardens. They weren’t disturbed by the weather at all and, again, I could just imagine how lush and green they would be in summer. There is a sensory garden with lot of different smells for those with disabilities, a huge number of cacti, a large orchid greenhouse, a rose garden planted in a spiral formation, a palm tree lined path, beautiful and ornate water fountains and a Japanese garden which I’m sure is beautiful too when the lilies are in bloom. I’m not interested in gardening but I do love the colours and shapes of these kinds of botanical gardens, and this was probably my favourite part of Rio de Janeiro. I left Rio on a rainy morning and arrived in São Paulo, the final stop on my destination, just as it was starting to get dark. It was a surreal feeling knowing that I wouldn’t be visiting anywhere else in South America. This would be my last hostel on the continent after staying in more than 30 in just four months. But I had something to look forward to in São Paulo, I would be visiting two friends who lived there that I had met trekking in Venezuela. So in a way, it would feel like ending at the beginning. First I had a day to myself to explore the city and see some culture so I started with a walking tour – of course. The guide for the tour was one of the best I’ve had, although the route did seem to be based around areas where we could get discounts from their tour at rather than sights to see. It did, however, take us down the famous Batman Alley where you can see São Paulo’s most famous graffiti art. If you’ve followed along, you’ll know that I am a big fan of graffiti and murals so this was right up my street. We even got to meet one of the artists who was riding by on a bicycle! I also went to the São Paulo Museum of Art on Paulista Avenue, one of the city’s most famous streets. Although the main exhibition on sexuality wasn’t to my taste, there was another interesting exhibition on the top floor that displayed the artwork on clear pieces on acrylic so it looked like it was floating, suspended in mid air. All the information about the artwork and artist was on the back of the piece of work so you would make judgements about the art itself before finding out more. The work ranged from 16th century to 21st century as you moved your way through the exhibition. The next day, my friends Wyllyan and Aline met me at my hostel and whisked me away on a locals adventure to a food market in the centre of the city where I tasted lots of unusual, exotic fruit and then we had lunch in a restaurant upstairs in the market. The building was built like a London train station with a big, arched ceiling and beautiful stained glass windows. It had far more sophistication than any market I’ve seen in London. After lunch we walked around the city centre, visited an amazing cathedral, went to the Japanese part of town (like chinatown in London), watched a weird 3D commercial film at the São Paulo Stock Exchange building and admired the architecture which resembled Gringotts Bank from Harry Potter, in my eyes. The park we had planned to see on my final day in South America was closed because of a Yellow Fever outbreak so we steered clear of that. Instead, we went to Ibirapuera Park in the city which has a stunning lake, ducks and swans, lots of trees with brightly coloured flowers and people running or riding bikes. It reminded me of a tropical version of Victoria Park in London. It was very peaceful in the daytime but apparently at weekends it’s very busy. Then we went to another art gallery which we browsed around and Wyllyan’s cousin, who worked there, took us up to the rooftop to see the amazing panoramic view of the city. São Paulo has more skyscrapers and cars than I’ve ever seen and from that viewpoint you could really get a sense of how immense in was. For my final meal in South America, a place where I’ve tried a lot of new and delicious food, Wyllyan offered to cook spaghetti bolognese for me, as he knew it was my favourite meal and his family are Italian. So to pick up ingredients we went to a place called Eataly – well, I could have lived there forever. They had everything Italian you could eat: fresh pasta, fresh mozzarella, gelato, wine, pizza. I tried at least five types of mozzarella and watched them make fresh pasta by hand. This might not sound very Brazilian but São Paulo is said to have the biggest Italian population outside of Italy so this food has very much become part of Brazilian culture. The meal was very delicious and before I knew it we were all in the car on the way to the airport and my time in South America was up. I was a mix of nerves and excitement as I sat on the plane waiting to take off – probably a lot more of the former than the latter. I had no concrete plans made for Canada beyond the first few days; I’ve never lived abroad before and I had used quite a bit more of my funds in South America than I had planned. I would no longer be moving place to place, meeting new people everyday but settling down in a town I’d never been to, where I knew no one and finding a job after five months without working. Yes, I was scared. But I also knew I was too scared to go back to London yet, without a plan or a purpose. In the four months I had spent in South America I had hoped some kind of divine idea would strike me about where I saw my life and my career going – but instead I think I buried the problem at the back of my head and enjoyed the time I had. As you can tell, I’ve made it to Canada and I’ve been living in Whistler for nearly a month – so I haven’t completely messed up yet. But I’m far from what I’d call settled in. I’ll just have to patient and see how it goes. Who knows, I might love it here and never come back to the UK – but it’s far too early to make those kind of decisions yet. Buenos Aries, the capital of Argentina and my first stop after a month in Patagonia, is the sixth largest city in South America and far too big for me to cover in just 48 hours. Why did I spend such a short time in this beautiful metropolis? Unfortunately, I was a victim to my own ambition, trying to fit too many destinations into just four months. With only two weeks left of my South America trip and four destinations still to visit (Buenos Aires, Iguazu Falls, Rio de Janeiro and São Paulo) I decided that Buenos Aires had more than enough attractions to warrant a whole trip to itself in the future. Also, the Latin America Art Museum (MALBA) which I really wanted to visit was closed for the whole of October – so I would have to come back. 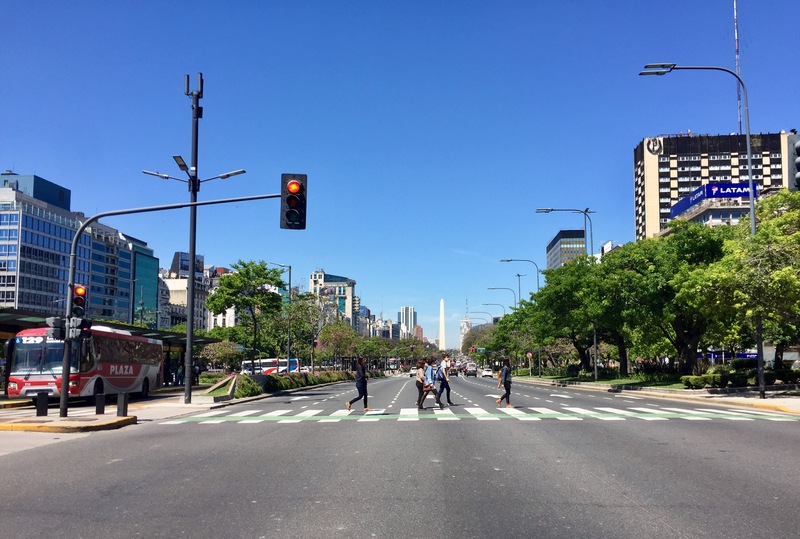 Although I only had a short time in Buenos Aires, I tried to make the most of it and still managed to fit a lot of sights into just 48 hours. My usual first stop in any big city is to do a “free” walking tour (they call them free but you still have to tip a fair amount). They always help you to get your bearings of the city, it’s easy to meet people and you can get some good tips of what’s worth seeing during your stay. I perhaps wasn’t as prepared as I should have been for this walking tour, setting off with just 30% battery power on my phone, but it was interesting all the same and gave me a good excuse to spend ages having a long lunch instead of traipsing around the cemetery taking pictures. 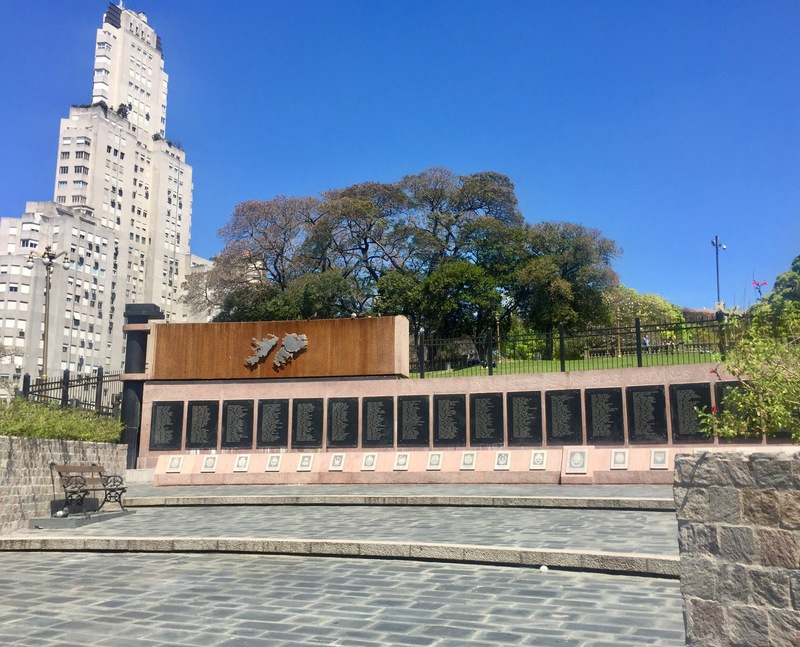 I learnt about the Argentinean people’s thoughts and feelings around the Falklands War and how it affected their communities, saw the building voted the ‘ugliest building in Buenos Aires’ and compared that different types of architecture across the city (most people think there are European-style colonial buildings in Buenos Aires but there aren’t). Although I’ve been on some better walking tours across the course of my trip, I’d still recommend it as a good start. 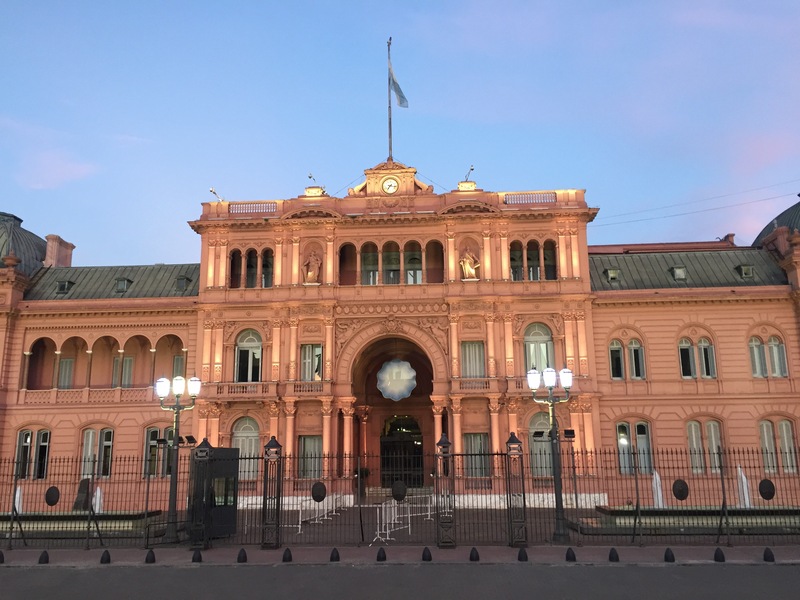 After a good nap (I had arrived at 2am after a delayed flight), I went to see the famous Pink Palace and Plaza de Mayo. Just as I was approaching the palace, I saw the end of a changing of the guards kind of ceremony. The Pink Palace was not as spectacular as Buckingham Palace, of course, but it was still worth seeing. By the time I’d got there the sun was just starting to set as well so it added to the pink colouring. It is situated in a pretty plaza with bright white architecture surrounding it and it is a great place to view the sunset from for a few minutes of peace and quiet in the bustling city. It would have been nice after this to eat out in a classy restaurant but still on a strict budget I settled for a couple of gin and tonics in the rooftop bar of my hostel. The next day I was sure to make the most of my time in Buenos Aires by getting up early to run around the Ecological Reserve, located right in the city centre. Unfortunately I don’t have any pictures from this as I was scared of getting robbed so I didn’t take my phone. This was an unnecessary fear as it wasn’t a remotely dangerous place to run. I didn’t realise before I set off that this was actually the same morning as the Buenos Aires marathon and the route I had planned would cross the official route multiple time. This was the first run I’d done in three months, despite telling myself and others before I left that I would be running all the time. I was a quite ambitious with my route and ended up running for over an hour and a half which was certainly more than I was physically capable of. Once I reached it, the Ecological Reserve was a beautiful place to run around with serval lakes and beaches. The skyline in the distance was a nice contrast to the surrounding greenery of the park. After a slow shower, I was already feeling the effects of running for too long, I headed out to the San Telmo Sunday street market – one of Buenos Aires’s most popular weekend attractions. The Sunday market continues further than the eye can see and must be more than 10 blocks long. I started in the middle walked up to one end and then all the way back to the very other end. It was exhausting but great. A real bustling artisan market and for once there was something different to Inca and Andean crafts. Buenos Aires has its own distinct style and this was clear in the market; it was filled with artist signs, music, leather works, handcrafted treasures, antiques and more. 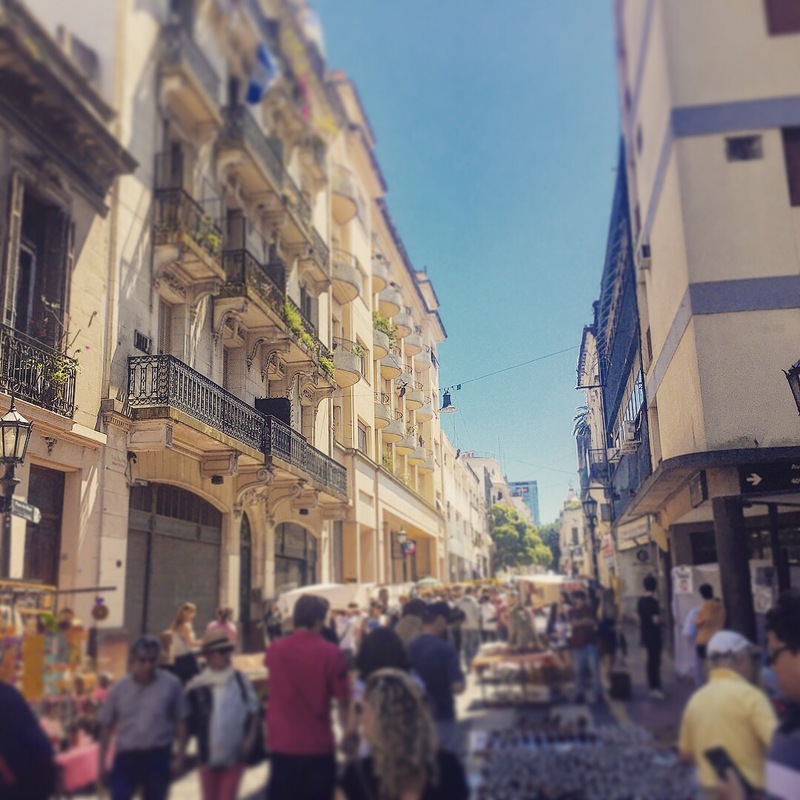 The street where the market finally finished opened onto the Museum of Modern Art of Buenos Aires (MAMBA) which I visited next. I like art museums but I don’t always enjoy modern art – I prefer the classics like Monet, Renoir, and Van Gogh – but in the third floor of the museum I saw one of the best modern exhibitions I have ever seen. 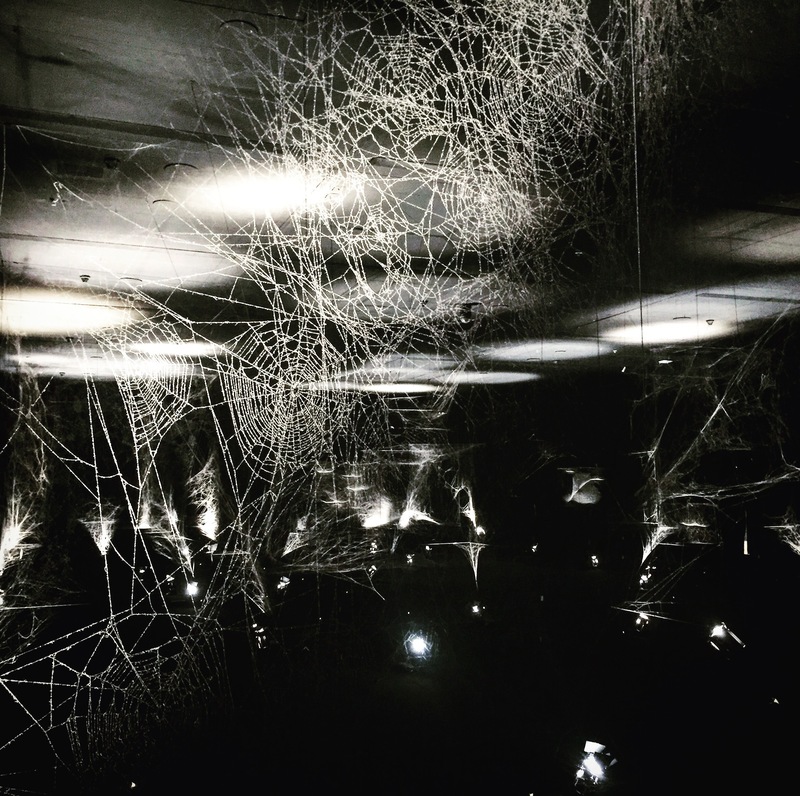 It was called ‘How to Entangle the World in a Spider Web’ by Tomas Saraceno and was created by eighteen colonies of spiders. There were so many times I kept wanting to reach out and touch the webs, just to check they were real, but obviously I wasn’t allowed to and couldn’t do that. 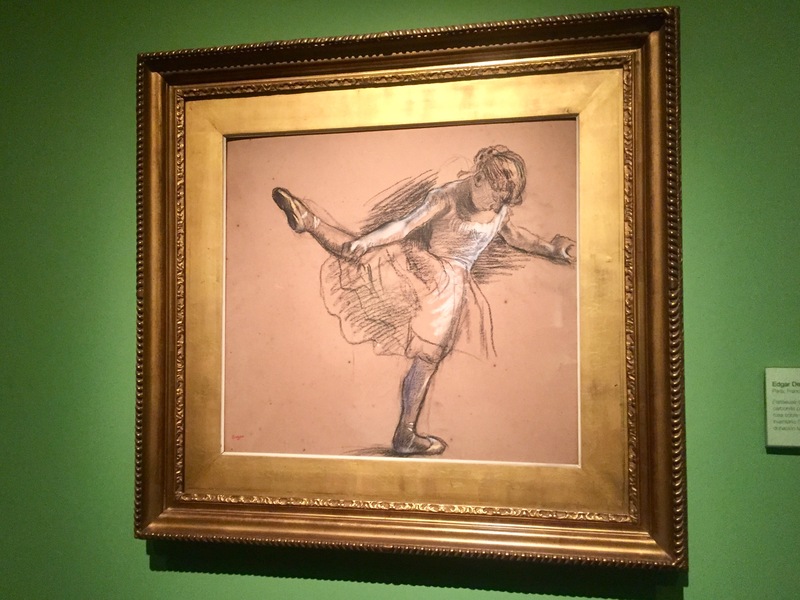 The cleverly placed lighting and eerie scuttling sounds that were being played quietly in the background added to the intensity of the unbelievable exhibition and I felt lucky to have stumbled across something so outstanding. Somehow I was still on my feet, though barely as I hadn’t sat down all day by this point, and I had to buy a bus ticket at the other end of town. I took the metro to the bus station and then decided, probably unwisely, to walk to the National Museum of Fine Arts (MNBA). 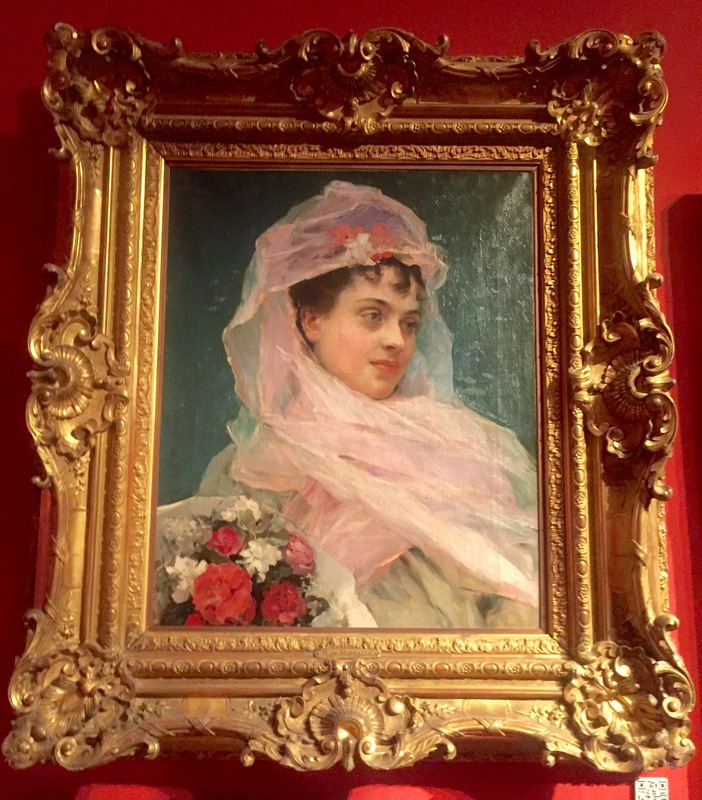 I was exhausted by the time I got there and although it had some nice pieces, it was nowhere near as good as the National Gallery in London or the art museum I had visited in Valparaiso. To be honest I was too tired to enjoy it and I spent most of the time taking pictures to examine more closely later. All in all I had a very short but mostly sweet time in Buenos Aires. It is a very sophisticated capital city and definitely one of the places I want to revisit in the future. 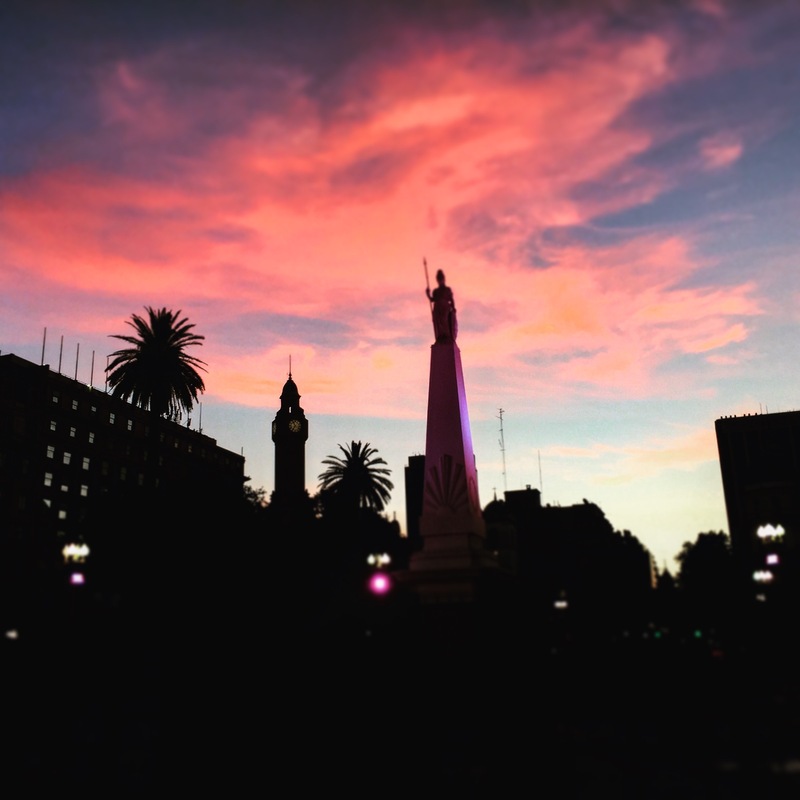 As the title of this post says, 48 is definitely not enough time to see Buenos Aires in all its beauty.